During my vacation last week, we found out that 57 bags of luggage were left behind in Toronto. The airline said that it was due to a weight restriction. It took five days to get the bags back to the resort we stayed at. In the meantime, everyone shared their belongings so that the people were able to enjoy themselves. The kindness of others sharing makes me feel ‘warm and fuzzy’. Yes, I did as well because my luggage was on time. Imagine that you’re at a resort with nothing to change into, no bathing suit, no personal items like creams, makeups, deodorants and so on. Wouldn’t you want others to help you out as well? My aunt in England’s house burned to the ground while I was away. She’s still in hospital with few belongings, and the love of our family. People tend to offer things to those in need. It might not be everything you need, but it’s a start. Are you kind as well? Imagine if everyone in the world shared their belongings to those in need. Wouldn’t it be a wonderful world? Be kind to others. Someday you’ll get rewarded by someone helping you out when things go awry. Tell me about something kind you’ve done to others. I’d love to hear from you. JINN & TOXIC has arrived! Here is an excerpt of Jinn&Toxic for you. When he stopped, she caught a look at his face and gasped. It was perfectly healed! He was incredibly handsome, even in the dim light. Thick, short black hair, and a five o’clock shadow shaped his chiseled features. The most incredible blue eyes she’d ever seen stared back at her with suspicion..
“What the hell is going on here?” she hissed as she tried to manage her pain. “I won’t do that.” He was a few inches above six-feet tall, causing her to have to crane her neck to meet his gaze. Before she could take him off guard and drop him, he spun her around and held her tight against him then stripped her of her head gear. Cries of surprise sounded as the teammates caught sight of her face. The Captain turned her to face him and frowned. Jinn held her silence, unable to tell them she wasn’t Juliette. She had to keep her presence a secret even from this team. A quick glance behind her proved he was mind speaking when someone came up and tied her hands behind her back. The wrenching pain brought out an unwelcome groan, and she cursed under her breath. “Captain, we have company coming. Can we leave this battle for later?” Blackstone asked. Two at a time the team members disappeared into the underbrush and left the Captain and Jinn alone. He dragged her off through the forest in a different direction, his grip tight on her arm. For hours she tried to keep up but her legs buckled from exhaustion and blood loss. The Captain squatted beside her. Sweat rolled off them both as thunder roared overhead, lighting flashing to fill the area with brightness. The wind picked up, rain slapping against their faces. All of the animals and insects disappeared to weather the storm, leaving Jinn and Tab alone. Her whole body was on fire with agony, but she remained silent and uncomplaining. His hand slapped down on her good shoulder and forced her to sitting position. His other hand gentled over her injury. A strange tingling in her wounded shoulder made her gasp. Furious, she could do nothing but wait until he lowered his guard then escape into the night. He walked off into the dark leaving her fuming. Damned alpha male with a command complex. Won’t listen to a word anyone else says! His chuckle came from the distance. to order your eBook copy today. 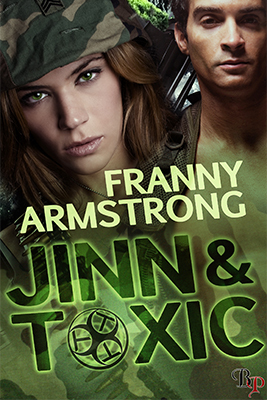 Today, I’m celebrating the release of JINN & TOXIC – Toxic Tango Troop book 1. I hope you get to read this fun romp through a Mexican rain forest filled with danger. Jinn is a feisty alpha female who is pitted against a hunky team captain of an elite group of psychic soldiers. When she battles to stay on top, he takes over and keeps her imprisoned with her heart. Tab McTavish is an alpha male who doesn’t take no for an answer when it comes to his team. He thinks she’s her identical twin sister and a traitor. Together they work to, not only take down a druglord, but find the real traitor on the team. If you’re looking for a quick paced story filled with adventure, download JINN & TOXIC today!